Through the eerie winter months, there was a small bombardment of trailers, teasers and online pranks that all introduced us to the disturbing ‘Owl Man’. Unfortunately he wasn’t the new ‘Slenderman’, but rather an impressive promotion for the upcoming independent horror film ‘Lord of Tears’. 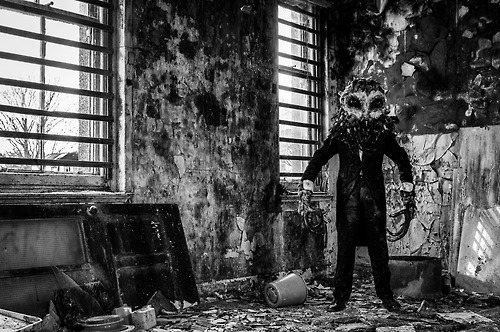 The brilliance of watching a grown man cry when confronted with the Owl in an abandoned children’s hospital, was enough to get me frantic about the film. Hence, I’ve been waiting ever since to watch it, and after finally obtaining a copy, it was time to see who the more-famous-than-Hedwig owl was. We follow James Findlay after the loss of his mother, who leaves him with two houses; one standard and the other a distressed mansion situated within the dense fog, deep in the vastness of Scotland. Ignoring his mother’s request to never visit the mansion again, James travels back there to unravel the mystery of his childhood and why he keeps dreaming of the Owl Man. But when he starts to trace back his childhood steps, he realises that his mother may have been right all along. There’s some kind of saying (unless I’ve made this up) that says that you shouldn’t build anything up too much, or your might be disappointed. Well, whatever that saying may be, this film should be its description. After becoming slightly hypnotised by the Owl Man and his dominating demeanour, I was certain that ‘Lord of Tears’ would provide an intense and creepy atmosphere with a fresh and intelligent story line. Well, my prediction came slightly true, but not in the way I’d hoped. The first half of the film did exceedingly well in slowly climbing with atmosphere through the use of a classic sounding horror movie soundtrack, oozing with dismal minors and spine tingling string melodies. To add to the white-knuckle feeling, there were some beautiful and dark shots of the surrounding scenery, and also some gruesome and bloody flashing imagery, which was captivating. Therefore the atmosphere was there, but below that, there wasn’t much else. The story starts off strong, but subsides to focusing on what was the less interesting subplot. When James is at the mansion, he befriends Eve, a flirtatious young woman, who seems almost too desperate for him, and way out of his league. At first she was unnerving and gave off an uncomfortable presence, with her being just too nice and chirpy (in the UK we know you’re strange if you’re always happy) but as events unfold, everything seems to become silly and over-acted. Nether-the-less I felt the film was pulled back at the last minute by the explanation of the ‘Owl Man’ and his hovering presence, along with quite an unexpected turn of biblical events. In the grand picture feel as if there could be major improvements to this film including the story and the acting (slightly hilarious at times) but it’s worth a watch if you’re into mind scrambling gothic horrors with a provoking atmosphere.